In this workshop I, Hanna, will show you how to create an Artist Trading Card (it is a miniature pieces of art) on fabric, how to play with some free-form stitching, create mixed media embroidery by painting on fabric, and then how to finish your lovely textile art piece! We will be working with the symbol of the Heart, but you can choose another simple shape, and work with your own favorite colors. Free-form embroidery is very loose and freeing, and once you know the basics – the sky is the limit. 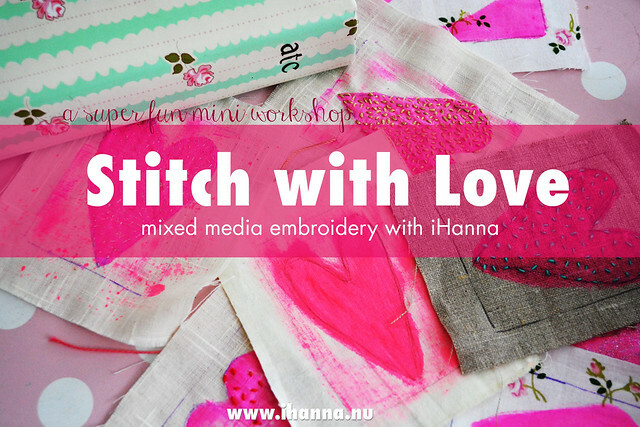 Stitch with Love is a Mixed Media Embroidery Workshop for everyone who wants to be inspired to try stitching, or get back into it after a dry-spell. You will get a taste of a little bit of everything when it comes to working on fabric. In the inspirational videos I encourage you to start straight away, just to get you going on your own piece of miniature textile art. I also share what kind of threads I like best, how I store my ATC:s and more. You will get a lot of inspiration that will last you for a long time from this little workshop. We will be embroidering small, finished art pieces. I love the Artist Trading Card format, called ATC for short, and hope you will too. It makes your small embroidery experiments into something “finished”, tangible and artful, which sometimes can be the hardest part when you dive into free-form embroidery. Where will this thing you’ve made end up and what will it become? Also, it’s super fun to use the ATC as a way to explore a theme or an idea, like I do with the heart in this class. More information about what ATC:s are in the workshop! The embroidery workshop is presented in a PDF file, that you get to download, print and keep for ever. Included are four videos featuring Hanna Andersson, a.k.a. iHanna, demonstrating all techniques needed to get started and then finish your project. This workshop is only 16 USD right now, but that might change in the future. Please act now if you want the workshop at this price. Delivery: When I have received your payment via Paypal, I will send you the PDF with all the information within five working days, but mostly it will be within a couple of hours. No previous knowledge of sewing is necessary, we’ll cover all you need to know here. Very Basic computer skills are needed (you need to be able to open a PDF, find your browser to watch videos, save and safe-keep your PDF-document). Supplies needed is a white/light piece of fabric, a sewing needle and some embroidery floss. 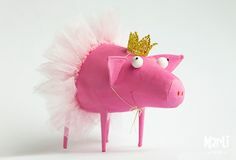 You might also want to play with fabric paint, a paint brush, and small beads, buttons or other embellishments. To finish you’ll need a recycled cereal box or a piece of cardboard, scissors and a glue stick. A high speed internet connection is recommended when watching the high res videos. Because this is a digital workshop, no refunds will be made, unless there are special circumstances. BONUS: Also included are two pages of ATC-backgrounds, where you can fill in your name before you print it out. NOTE: Links in the PDF:s do not seem to work on iPads/Apple platforms, but the video links are also printed in the last page so you can copy them from there and paste them in your browser to watch the videos online. Thanks for your understanding. ATCs aren’t an art form I have tried before, despite being quite a dabbler. Thank you for making me stretch myself creatively! I thoroughly enjoyed your videos, pdf, and free printables! I really enjoyed trying different stitches, and being mindful while trying mindless stitches. I also enjoyed learning the Y stitch! Feel free to send me questions any time, and later pictures of your project to get feedback and maybe be featured on my blog. Just include a blurb about your project, material, previous experience with stitching, your idea and any links to social media, if you want to be featured. Once you payed I will send you a link to download the pdf-files associated with this workshop, and in it is all the information you need! In the PDF you’ll see lots of photos of all the examples I stitched, get how-to-instructions for the different steps in the workshop and links to the videos. Please treat this document as a valuable by keeping it safe on your computer.You always have no less than one year access to the videos, from the date you pay for the workshop. During this time you will be able to watch the videos when ever you want to. You work in your own pace, when ever you want to. Please note that this workshop was originally created for Alma Stoller’s learning ground STITCHED, a year long class hosted on her site, featuring several other teachers and ideas. But now that Stitched is closed I’m selling my part as a stand-alone mini workshop. I hope it will inspire you to stitch your little heart out with me! Would you like to be notified when the next workshop opens up? Sign up for iHanna’s Newsletter, and you’ll be the first to know! When you sign up I will send you a free PDF of inspirational quotes to use in your planner, notebook or journal. All payments for my workshops and services are handled through Paypal, but you can also get a secure payment via Paypal by choosing to pay with a credit card.